If the 10th Doctor is your favorite then this would be the DVD set to get. This DVD set offers the complete David Tennant years so all the episodes of the 10th Doctor and tons of extra’s. Doctor Who fans can start enjoying series 2, 3 and 4 all over again and then there are tons of extra’s to enjoy as well. This complete set of David Tennant DVD’s as Doctor Who is good for 40 hours of amazing TV and that all in a great looking box set and of course 26 DVD’s. 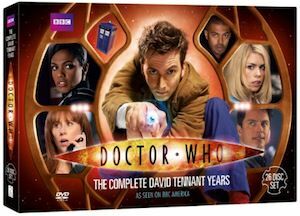 So if your Doctor Who collection is missing the David Tennant years then come and get your Doctor Who The Complete David Tennant Years DVD Set.